Alex's Cycle Blog: Individual Pursuit - What Makes us Faster? A long time ago, in a galaxy far away, a Jedi Knight called Andy Coggan developed an insightful (but often misunderstood) table of numbers known as Power Profiling. Power junkie cyclists have been (mis)using the table to psych out their mates for years now. 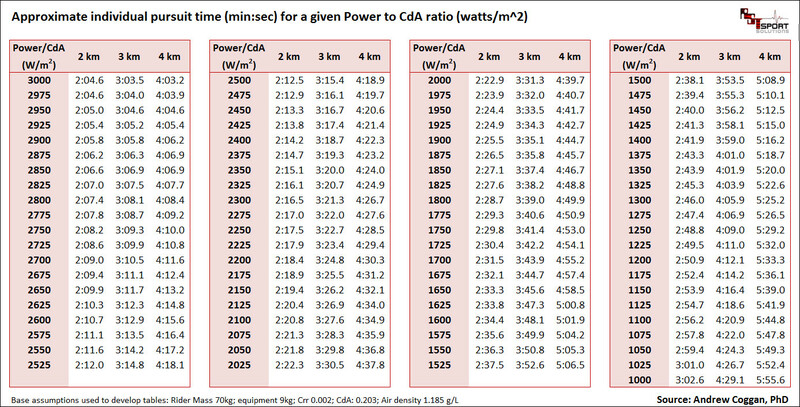 The Power Profiling table lists power to body mass ratios for four key durations: 1-hour, 5-minutes, 1-minute and 5-seconds, chosen to reasonably represent the energy systems/physiology that predominantly underpin performance over these duration, i.e. (respectively): lactate threshold, maximal oxygen uptake (VO2max), anaerobic work capacity & neuromuscular power. Power to body mass ratio is an excellent overall predictor of performance potential. It is especially good for determining performance when climbing hills. However, performance in flatter time trials and individual pursuits is much more a function of power and aerodynamics than it is of power and body mass. Body mass of course impacts aerodynamics, however the relationship between them is variable, with overall morphology and position on a bike far more influential than body mass per se. 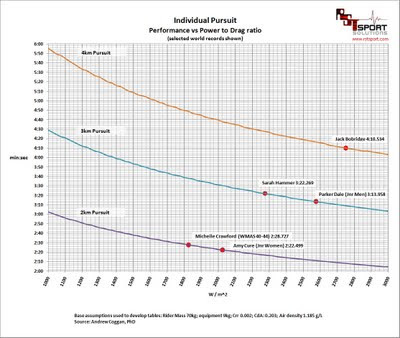 So, when choosing the one performance factor most important for flatter time trials and pursuits, one needs to focus on improving a different ratio – the Power to Aerodynamic Drag* ratio (power to CdA ratio - W/m^2). The higher the W/m^2, the faster we go. Pretty simple really. In 2009 Jedi Knight Coggan, being somewhat prescient, developed a draft version of his power profiling table, this time expressing performance in terms of the ratio of 1-hour power to CdA . I’d love to share a link to it, but I’m not sure I have a public location I can point you to (it was originally posted on a discussion forum about two years ago which has suckerific search function). I’m sure either Andy will provide a link, or post up a new blog item about it at some stage. In any case, I thought at the time it might also be of interest to develop a similar table for the Individual Pursuit, so Andy whipped up one for me, and I then took that data and created a chart and table. Now that was nearly two years ago and I've been meaning to do a blog post about it ever since! Okay, so it's a little late but here it is. 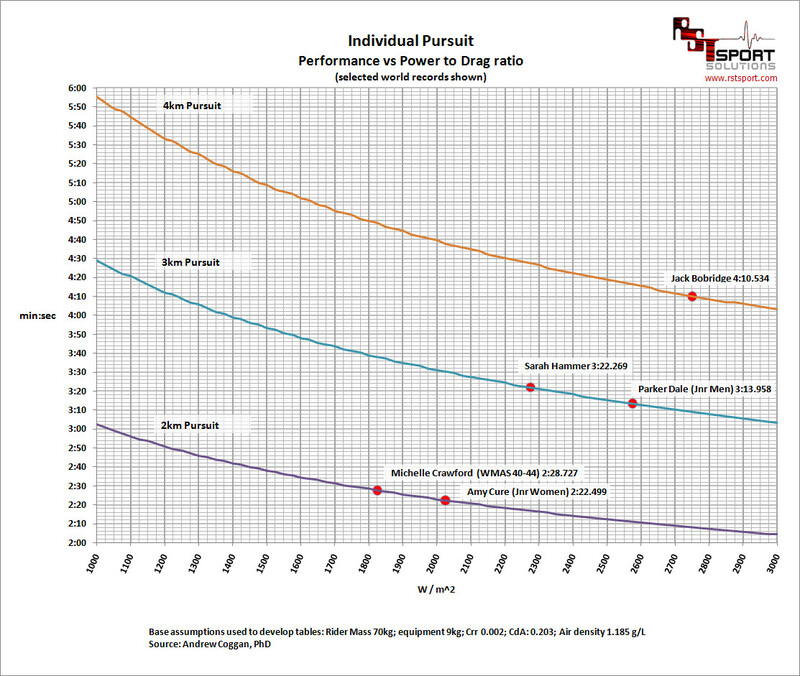 So, for example, if you want to ride a 3km pursuit in 3:35, you will need a power to aero drag ratio of about 1900 W/m^2. Alternatively, if you know your power and pursuit time (on a fast track), then you can back calculate an estimate of your CdA. e.g. 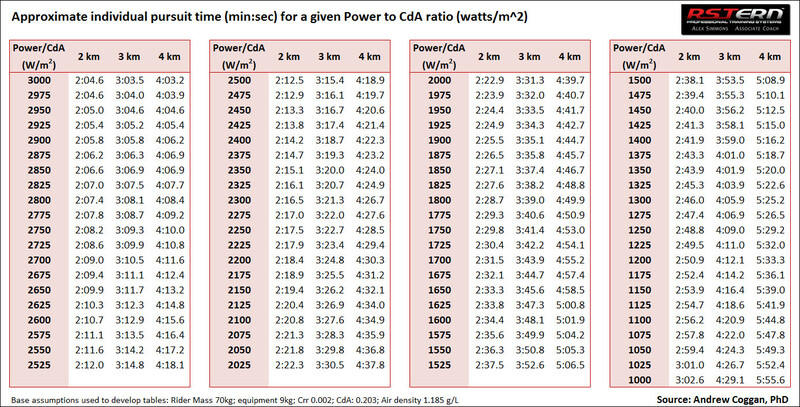 a rider who completes a 4km pursuit in 4:30 requires a power to aero drag ratio of ~ 2200W/m^2. If we know their power output we can then estimate their CdA. Let’s say they averaged 480W. It’s not perfect of course, just a guide and there are many factors to consider. Besides, if you have a power meter on your track bike, there are better ways to determine your CdA. With the exception of Sarah Hammer’s WR in Aguascalientes, all of the others were set at sea level and in indoor velodromes (and so the assumptions used for the table data will be closer to the mark). In the case of Sarah Hammer, due to the significantly reduced air density at altitude, it is probable her W/m^2 is overstated and is a little less than previous world record holder Sarah Ulmer whose record was set at sea level. 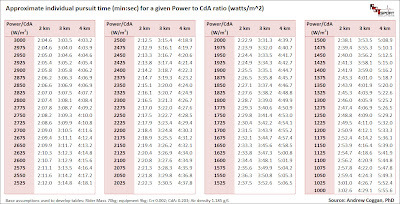 The Power/CdA estimate for Ulmer’s 3:24.537 ride is 2200 W/m^2. One thing the chart emphasises is just how much one needs to improve W/m^2 in order just to go even just a few seconds faster. When you are near your physiological performance (power) limit, we can see how important aerodynamics are to overall performance. And just how freakin good those world record rides are. Now of course there are some assumptions used to make up the data for the tables (assumption are shown on the table and chart). For example, it does assume a pretty fast track/tyres at a typical sea level air density, but really it’s just a guide, and serves to emphasise the importance of aerodynamics and thinking in terms of W/m^2 when working out what to focus on to improve your pursuit and time trial performance. 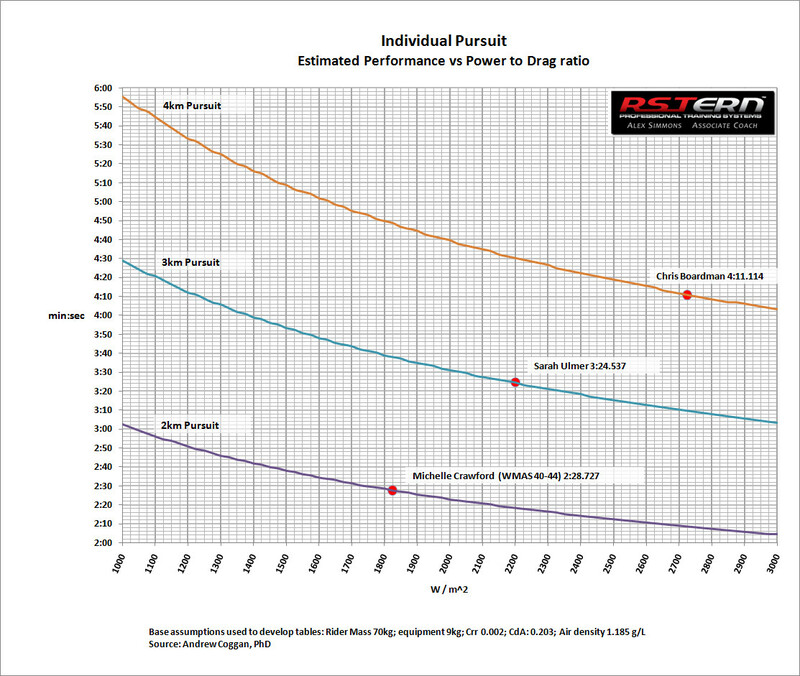 If your track and/or tyres are slower than the best, then it’s likely the performance suggested as attainable from a given power to aero drag ratio is overstated (or the W/m^2 required for a given performance is understated). Also, the rate of change in kinetic energy and associated variable power demands will also have some impact on these estimates. These data have used typical assumptions for that, but of course everyone’s initial acceleration, mass and fade in speed during their pursuit rides are different. I’ll look into doing a similar chart for the hour record at some stage. Where do you fall on the table? - Effective Frontal Area (A), measured in square metres (m^2) which is how much area we present to the air (e.g . compare a van and a Mack truck – the truck has a larger frontal area and has to push more air). These two factors are multiplied together to determine how "slippery" we are through the air. See my next post - Andy sent me the data for the hour - FTP/CdA ratios. Nice post, of course world records are freakin good, they are world records after all! Yes, of course WRs are freakin good, doh! My point really is how shallow those lines are - in other words a small change in time requires a large change in W/m^2 to achieve it. What assumption is included here for the starting effort? Is the missmatch between 2km and 4km times purely due to aerodynamic considerations at lower speeds, e.g. starting period a greater proportion of the 2km ride, or is there something else included too? There's reference on some forum topics to adding 7-10% to the power required to ride steady state at a particular pursuit speed in order to calculate the power required including a standing start. Should that be added here or is it already accounted for? Cheers! Yep, like Alex asked above, do these projections take the lap one into account and if so, what is the compensation for it ?